Rachael Gately poses Olive Junior, a Dorset sheep, at the Big E, the largest agricultural event on the eastern seaboard. A Tufts Veterinary Field Service veterinarian who has been showing sheep since she was a child, Gately has produced three of the last four national champion ewes. 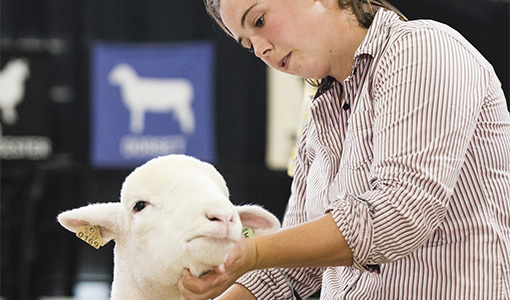 At September’s Big E, two of her sheep qualified to move on to the 2017 nationals in Louisville, Kentucky, in November.